I consider myself a good networker. I get cards at conferences, forward my contacts relevant job opportunities, and try to find opportunities to bring people from various facets of my life together (my new favorite way to do that is couple date nights). I don't spam my contacts and I try to make myself available when people in my network need me (my blog readers are at the top of that list). So why am I having a crisis of confidence of my networking skills? The answer is the beast that is LinkedIn. You link with other people in the network to create an online professional network. At first it seemed to be endless friend collecting for no real purpose but I have started seeing people like Lucy Bernholz use the Q and A feature in really creative ways. I started getting all giddy with excitement thinking about all of the ways I could harness the wisdom of crowds for social good. Maybe my network has the answers on how to solve poverty, maybe they know about a great up and coming prison re-entry program that foundations could bring to scale, and maybe they know when Bill Strickland will be in Minneapolis so I can pick his brain about new solutions to old social problems. The options were endless, so I decided to be more proactive about who I added to my network. I looked for fellow PPIA alums because they are spread out through a variety of sectors but have a common committment to using policy for social good, ABFE members because they may have ideas of how to uplift black communities through philanthropy that I can apply in Minnesota, and EPIP members because fresh perspectives are always useful and then I will always have someone fun to have dinner with when I am in a new town for a business trip. My network grew and grew with people who want to make the world a better place until I had 113 connections and a network of 467,000 professionals. I want you to join my network on LinkedIn. Here is what I have gotten from this experience. I was one degree away from Bill Gates, which means that his spam filter is way off. I feel a little terrible taking time away from Bill Gates Sr.'s day, when he could have been curing malaria and fixing our ailing education system. He had to spend that time telling me to buzz off. I may have overreached but you never know until you try. I'll take a few buzz off and "nice try, small fry" to get to my ultimate goal, which is to build a strong network of people who will make positive change in this world. 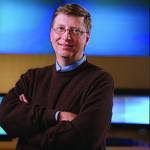 So if you are interested in joining my Bill Gates-free LinkedIn network (maybe it's better that he isn't there, he might just spam us with ads for Vista) then click here.